When we shop at Costco, the amount of meat that you are forced to buy is enough to feed a small army. Rather than break down the meat into smaller portions to cook, we prefer to cook it all and then freeze whatever is left. The question is then, how can I cook so much meat on my Weber Kettle? I’m also using a device called a Smokenator which takes up part of the grill and so I’m left with even less space for the actual meat. I saw a device that I could add on top of my regular grill, but the problem was the cost – $45. It seemed a bit much for just an extra grill. I decided to make my own 2nd story grill. 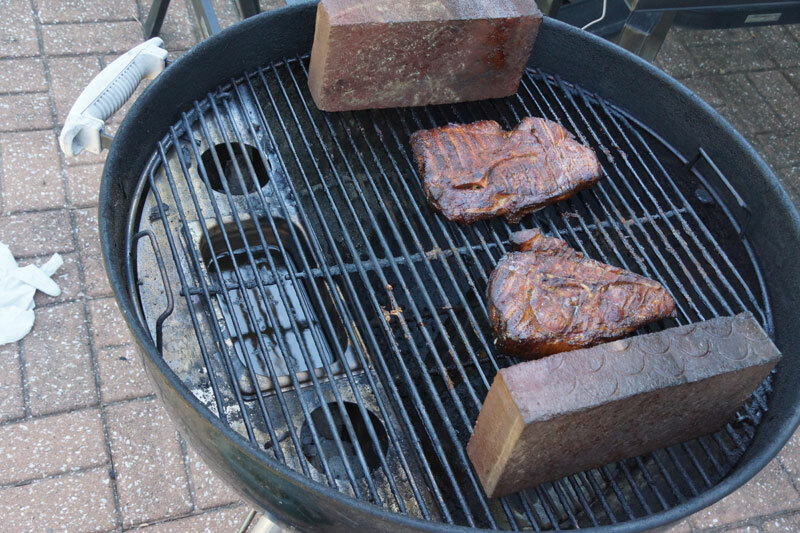 It was as easy as buying a 18″ grill for around $10.00, putting a couple of bricks on the first level grill and putting the two together. It fits under the cover well and the meat seemed to cook well in all locations. I’m testing out the Smokenator 1000 in my Weber Grill. It’s a bit expensive, $75, for what it is, but seems to do a good job at smoking meat indirectly and keeping the temperature under control. I’m doing some testing today on some chicken wings and this is my setup. I’m not using their included water pan. I am using a water pan in the middle of the grill which I fill about half-way with boiling water. Notice I also put alum foil in the bottom of the grill to help with cleanup. I put 60 unlit briquettes in the Smokenator. Attach a temperature probe to the grill to monitor the temperature. Turn a chimney starter upside down and light 12 briquettes – takes about 15 minutes. I adjust the bottom vents to approximately 1/2 open and leave the top vents totally open. Put the lit coals on top of the unlit coals. Put on the lid and wait until the temperature comes up to 250 degrees. Add boiling water to the alum pan. 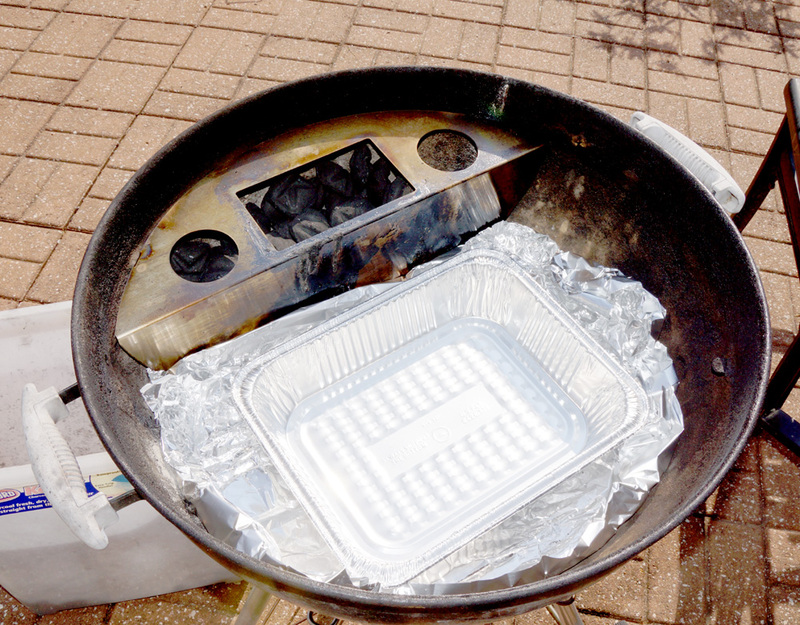 NOTE – Amazingribs says to put a water pan OVER the charcoal on top of the grill. I need to give that a try. Weber takes about 10 minutes to get to 250 degrees. If temperature goes too low, knock off the ash and mix up the briquettes. Even after four hours the temperature stayed at 250 degrees. I’ve changed my setup to something very close to the directions which come with the unit. light 12 coals and put them in the top. add water to the Smokenator water base – you will periodically have to fill this up. I put in regular tap water. Add charcoal and chips every couple of hours to keep the fire level up and the smoke rolling. I add a 2nd level with bricks and a smaller grill – works well. I leave all vents totally open. If the temperature starts to get close to 300 degrees, I partially close the bottom vents. Overall, I’m very satisfied with the Smokenator. It seems to do a good job of providing indirect heat for an extended period of time. I thought I’d test how hot my gas grill gets in different parts so I turned up all the burners to high, let the grill get hot and the put on some standard white bread. After two minutes you can see the results. Now I know where the hottest part of my grill is and where is the coolest. 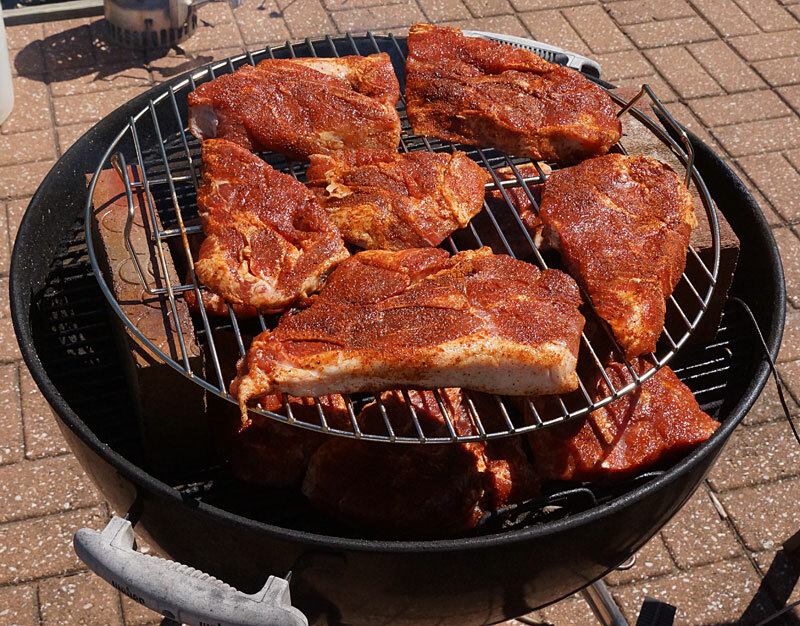 I’m compiling different rubs that people use for BBQ. Most of the rubs are very similar, the main difference being the proportions. Do you have a favorite?